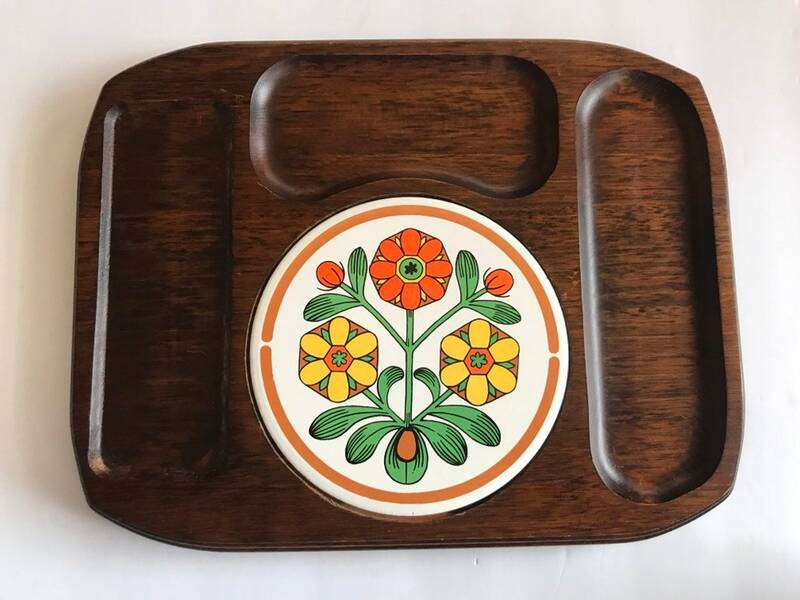 Vintage Mid Century cheese & cracker tray / board with Himark tag on the back. Such an awesome find and will be a great addition to any MCM collector's kitchen. It's in awesome shape but a few imperfections in the wood -please look at the photos. Really only see flaws when looking for them. The floral ceramic tile has a very Danish Modern look to it with bright orange, yellow & green flowers. There are also 4 rubber stoppers on the bottom to keep it from sliding. The tray does not seem to be used much if at all! The board measures approximately 12.5 x 10 inches. The tile is 4 1/4 inches in diameter.